Do you have any idea how many unfinished projects I have around my house? No? Me either. There's too many to count. I have good intentions, but I'm easily distracted. There seems to always be something else that needs to be done. For example, I've been bombarded by distraction after distraction just this morning. I sat down at my computer like a good girl, ready to get my blog posts done. Oh, I need to check my email. Well, what's this? Ooh! Look at that. I need to check that out. Let me look into that. I need to respond to this one, or I'll forget. Two hours later, I find myself still sitting in front of the computer. I've gotten a lot accomplished, but none of it had anything to do with my initial goal: to write my blog posts. In the world we live in, distraction has become inevitable. With computers, television, cell phones, radios, playstations, cars, books, etc., there's simply no end to distraction. As if that weren't bad enough, our own minds constantly distract us from our immediate tasks. What are we going to have for dinner? Did I put the laundry in the dryer? I wonder what time my hubby will get home tonight? I need to pay the bills. Hmm, is there any money in the bank account? Should I get another job? On and on it goes. 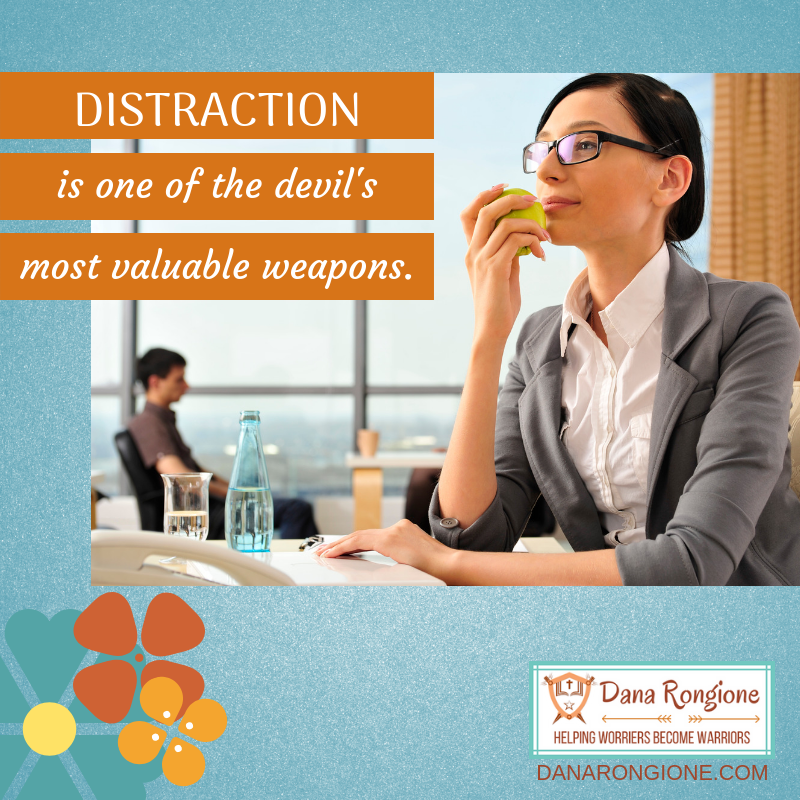 I believe distraction is one of the devil's most valuable weapons. With just this one weapon, he can get us to stop doing the work of the Lord, not because we don't want to serve, but because we're too distracted to notice we're not serving. While we're quietly trying to go about the Lord's work, Satan is sending flashing neon signs to draw our attention away from our true goals. With most of us, it works like a charm every time. We're so gullible! Oh, that we would be more like Hank Aaron. When the devil comes to us with distraction, we say, "I didn't come here for that. I'm here to do what the Lord called me to do." It will take focus. It will take discipline. It will take constant monitoring. But we must avoid distraction at all costs. For more on the subject of distraction, check out my book, The Deadly Darts of the Devil. One day, two monks were walking through the countryside. They were on their way to another village to help bring in the crops. As they walked, they spied an old woman sitting at the edge of a river. She was upset because there was no bridge, and she could not get across on her own. The first monk kindly offered, "We will carry you across if you would like." "Thank you," she said gratefully, accepting their help. So the two men joined hands, lifted her between them and carried her across the river. When they got to the other side, they set her down, and she went on her way. After they had walked another mile or so, the second monk began to complain. "Look at my clothes," he said. "They are filthy from carrying that woman across the river. And my back still hurts from lifting her. I can feel it getting stiff." The first monk just smiled and nodded his head. A few more miles up the road, the second monk griped again, "My back is hurting me so badly, and it is all because we had to carry that silly woman across the river! I cannot go any farther because of the pain." The first monk looked down at his partner, now lying on the ground, moaning. "Have you wondered why I am not complaining?" he asked. "Your back hurts because you are still carrying the woman. But I set her down five miles ago." - Dr. Anthony T. Evans, "Guiding Your Family in a Misguided World"
Bad things are going to happen. Friends are going to let us down. Family members are going to forsake us. Bosses are going to promote "the other guy." These things are part of life. We all wish they weren't, but that doesn't change the facts. Life is full of ups and downs, goods and bads. It's up to us to deal with it! I once heard a bitter person described as one who drinks a poison and waits for the other person to die. Bitterness doesn't hurt the person or situation that wronged us. It hurts us! It drains the joy out of life. It causes us to bear extra burdens that would be better off left far behind. Eventually, it will start to affect the people around us. Then we really have a mess! During His time on Earth, Jesus spoke a lot about forgiveness. When we've truly forgiven someone, the bitterness will disappear. I'm not going to tell you that it's easy because it's not. Just like all our other spiritual housecleaning, removing the stain of bitterness can be quite a chore. But, it is possible, and the Lord will help us. Yuck! Another hard one! I often tease that "worry" is my middle name, but on the serious side, I wonder how much time and energy I've wasted because of worry. Worry takes a lot from us and gives nothing in return. We've all heard the phrase "don't make a mountain out of a mole hill." That's exactly what worry does. It takes situations and magnifies them to the extreme. The bad part is that most of what we worry about it either stuff that never happens or things we can't do anything about. Ouch! That hurts, doesn't it? If you're like me, you cling to your worry like a nice fuzzy blanket. For some reason I feel that if I'm worried about something, I've taken the first step to solving the problem. How messed up is that thinking? I'm not solving anything. I'm simply creating more problems and more stress. Who needs that? Over and over again in the Bible, God tells us we can bring our burdens, worries, and fears to Him. He offers us comfort and shelter. He offers to take our heavy loads. All we have to do is turn them over. Sounds simple, but it's not. . .at least, not for me. Some people seem to be really good at it. My husband is. I've asked him many times what his secret is. He tells me, "It's easy. You just let it all go. You don't think about it. You don't worry about it. You just hand it over to God and allow Him to handle the situation the way He sees fit." "But how?" I always respond. "How do I make myself stop thinking about the problem? It's all around me. How do I stop worrying about it? It seems to be all I can think about. How do I let it go?" The Lord is still working with me on this process. Fortunately, He's a good teacher. Unfortunately, He likes to use a lot of "real life object lessons." Those are real eye-openers. Let me tell you! The main thing I'm learning about worry is that I have to stop it before it starts. If I let myself start, I can't stop. I've found, however, if I turn the burden over to the Lord before it becomes a worry, I do much better. I'm not likely to win any medals, mind you, but I'm learning. Another thing I've noticed is the days I spend more time with the Lord are the days I worry less. When I take the time to talk with Him and immerse myself in the comfort of His Word, I'm better able to fend off the worries that come throughout the day. A woman who had lived long enough to have learned some important truths about life remarked, "I've had a lot of trouble -- most of which never happened!" Let's not be the same way. Let's turn our burdens over to the Lord and LEAVE THEM THERE!